These sessions range traditional support groups to single pop-up events. Sessions are led by experts in a variety of practices and allow caregivers to face everyday life with self-awareness and a strengthened sense of support and community. All Caregivers are invited to join us for this 1-day retreat designed to pamper, educate and empower you as you care for your loved one. This unique event will include massages, breakfast & lunch, fun & education breakout sessions, informational community resource booths and the opportunity to connect with other caregivers in the community. Contact Julie Walker or call (317) 254-0828 for more information on upcoming events. Have you ever wondered what it would be like to express your feeling through a medium other that words? Join us for the fun and enlightening Caregiver Expression as we are guided through thoughtful exercises by a certified Art Therapist. Traditional support group with a fun twist. This time is designed to be a safe opportunity to share the joys and frustrations of caregiving as well as learning and gathering helping information. This insightful dinner is designed to provide a small glimpse of the life of a person living with a disability. Attendees will be given a disability to “live with” during dinner and are free to order at will from the Scotty’s food and drink menu. Attendees are expected to pay for their own meal(s). This event is hosted by Joy’s House and Caregiver Crossing and is designed to increase empathy and understanding of the difficulty that individuals living with disabilities face each day. 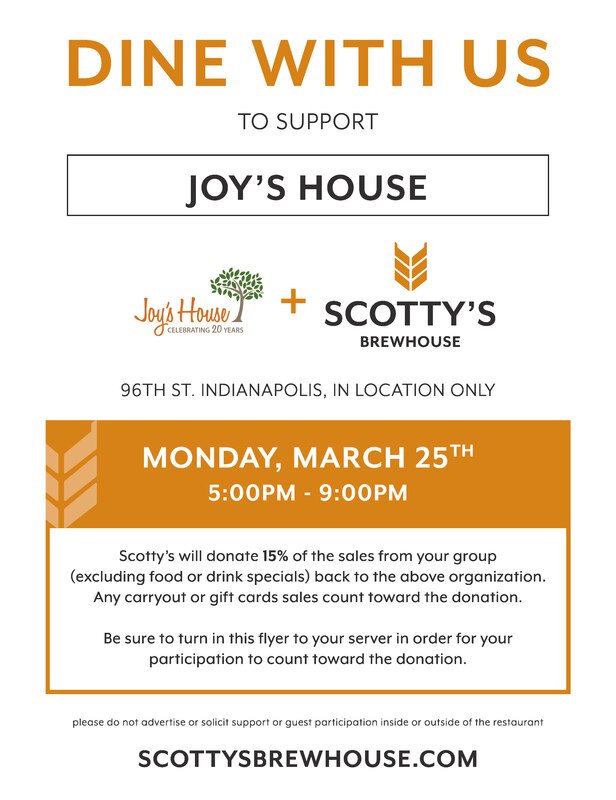 Scotty’s has graciously agreed to donate back a portion of proceeds; download this flyer and take it with you to the event! Candace hosts this monthly “open office hours” as a time for caregivers to drop by and chat. Formal registration isn’t needed, but if you would like to let Candace know to expect you, feel free to drop her a note. Unleash your aroma-therapy creativity at this hands on event. Attendees will each make mix and pour their own candles to take home with them. Space is limited, so if you’d like to join us, be sure to register today. There is a $20 fee for attending. All caregivers in the community are invited to join us for the retreat designed to celebrate them! This 1-day retreat will include massages, breakfast & lunch, education but fun breakout sessions, a community resource area and the opportunity to connect with other caregivers in the community. There is a $25 fee for attending this retreat. This fee includes care for your loved one available at both Joy’s House locations (space is limited). If your loved one is not already in attendance at Joy’s House, we will need to capture basic medical information for us to best care for your loved one at Joy’s House during the retreat.